Are you ready to change your job or career? And start working naturally and effortlessly so that you get ENERGIZED by your job…instead of drained, dumbed out, dumped on, or dead-ended? Do you feel like you have PLATEAUED in your present position? Do you DREAD getting up in the morning to face another workday? Are you BURNED OUT, wondering if your work really counts? Are you SEARCHING for meaningful work that gives a sense of purpose? Are you are on SICK leave? 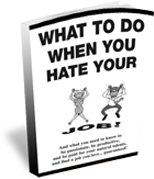 Do you want to change jobs but feel STUCK? Do you FEAR you don’t know what else you could do for a living? Do you push your passions to the PERIPHERY of your life? Do you feel like a SLAVE to mediocrity? Are you just COASTING until retirement, death or you win the lottery― whichever comes first? You CAN get excited about going to work each day. You CAN earn a six-figure income and all you’re worth. You CAN enjoy excellent health, and grow in confidence, self-respect, courage, peace of mind, and all the other factors that foster quality of life. Job change is the new workplace reality. Whether its voluntary or involuntary, an ever increasing number of us must learn to make effective job changes quickly in order to protect and promote our careers. Whatever the reason, there will be increasing pressure on many of us to develop skills and abilities to change not only jobs but careers in the forseeable future. So, why not change to a better jobfit, to a new career that will recognize, reward and motivate you for what you do naturally and effortlessly. There are thousands of new jobs in our economy, and probably a dozen or more that require your unique combination of talents and motivations, jobs that will better harmonize with your values and priorities. A major research study employing 7725 participants and 62 career intervention studies (Brown, Ryan & Krane 2000), concluded that the number one critical ingredient for improving the effectiveness of career decision-making was written exercises and workbooks. In other words, you can write your way into your right work. One of the most effective writing exercises to help you identify job options is a story right under your nose… well, behind your nose actually! Stored in your brain are memories about events and activities you truly enjoyed in life since childhood. I want to send you a JobJoy Story exercise that will pull those stories out of you, and provide you with easy-to-follow instructions to help you write about times in your life when you were doing what you enjoyed most at school, home, work and elsewhere. The power of your stories is in the facts, people, and events of your life. These stories are like veins of gold that run through your life. Mining gold, however, involves moving a lot of ore with tools and equipment to get at that precious metal. Similarly, mining the veins of gold in your life is easier when you use a tool that separates the wheat from the chaff. Focus only on what you found particularly enjoyable or consistently satisfying in those events/activities. Don’t psychologize yourself, stick to the facts, tell the story. Writing out stories about events and activities you truly enjoyed is a proven process that has helped thousands of people just like you translate their natural talents and motivations into rewarding and lucrative jobfits! “Put an end to the confusion and start enjoying the career that’s right for you! The JOBJOY REPORT breaks through the barriers that keep you from finding JOB SATISFACTION in your life. Find out who and what you are in terms of your right work. Get right down to the essence of what you enjoy most and do best then match that vital information with specific jobs in specific organizations. In short, the JOBJOY REPORT is a "Career Confusion Buster." Everybody has 5 to 8 innate talents of which they are not even aware. They don’t know how to put that information to work for them to guarantee a long, happy, and prosperous life. And these talents can be matched up with 10 to 25 specific job titles in dozens of organizations this is the power of achieving Job Joy. That power is available to you right now! Janie Gilmour was a medical secretary who loved to proofread her boss’s correspondence. As she said, “George’s analysis made me realize that paying attention to my natural skills was important. He gave me the confidence to go through the process of finding a way to use them. 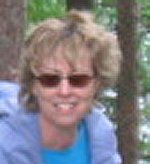 She started Highgrove Editorial Services, and since then, “life is great – I’m closer than ever to reaching a balanced lifestyle.” Janie was able to find the right fit because we were able to distinguish between similar talents. If she had chosen to write for a living, it possibly would have led her down a path of life dissatisfaction and job misfit rather than job fit. Your career decision-making will be more effective with an accurate and reliable picture of your key success factors. And to really nail down the essence of who and what you are in terms of work when you are doing what you enjoy most and doing it well. And it will help you to communicate to others with clarity and confidence what that is. Sometimes the transition is sideways, working in the same space but in an entirely different job, one that better harmonizes you’re your key success factors. Take the case of Kanwal Sarai. After 12 years as a software tester with a large telecom company, Kanwal was "bored, unfulfilled, frustrated and unmotivated." He needed to make a career change if he were to find professional fulfillment. "Upon reviewing my stories, George’s assessment was 100% accurate," says Kanwal. "Having him articulate my natural abilities and talents was a big eye opener for me. He identified me as an innovation evangelist, a person who is a great communicator, able to take complicated technologies, products and services and explain and present to people in a clear concise manner. I was a natural communicator who would do well in training, marketing or product management roles. This was big news to me." He now works with Product Management, conducting and leading live training sessions, and working on marketing materials related to a state-of-the-art telecom equipment used by law enforcement agencies and intelligence communities. "I reconnected with the essence of who and what I am in terms of my right work," he says. 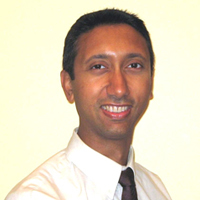 "George was a fantastic help in identifying my natural talents and abilities. He was extremely helpful in providing me with a road map, but I was the one who had to drive." Kanwal was recently promoted to a position with more responsibility and "held accountable for bigger decisions. The job continues to get better and I look forward to going into work each day," he says. "Each day brings on new challenges and the opportunity to make a positive impact in the world." Some people grow out of their job. Where it was once stimulating and challenging, the job is now boring, mundane and predictable. They want a big change. They want to move overseas! Take the case of Taba Cookey. 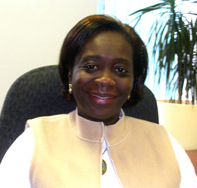 She now travels all over Africa and has to deal with different personalities in differing cultures representing a new international financial institution called the Africa Finance Corporation. "The other day I went through the life stories I had written and the analysis you had done four years ago now, and was amazed at the way it has all come together in my present job," said Taba. "It is really quite uncanny. But then again perhaps not, since you had so accurately identified the kind of work and environment that would give me ‘jobjoy’ and I have finally found it. It is not surprising that I can now say without hesitation that I have never enjoyed work so much, and…yes, feel fortunate that I am actually getting paid for it. I come to work every day with a sense of anticipation, and hardly know where the time has gone at the end of the day. I actually have to tear myself away! This is such a change from so much of my previous life spent clock watching and day dreaming at work." At other times, a career transition is a radical shift. Take the case of Nigel Harris. He was an engineer for over 20 years, and spent many days soldering circuit boards. He always had a love for music but thought he was doomed to career pain. "I am truly honored to be able to earn my daily bread singing and playing and being in close relationship with some of the most loving, open and playful people on the planet." Nigel says his days are full of miracles. He loves the way music touches his clients in a way that nothing else can. Nigel reflects, "It was not an easy process to go through, no quick fix, and I can see why many people choose to resign to their present situation rather than surrender to the terrors of the unknown. What excites me is that now I can see that doing what you love for a living IS available to everyone who surrenders to the process, admits that their way is not working and… asks for help!" Others have followed the action plan of a JobJoy Report to achieve a great jobfit. You can too! In my Report, I will answer the questions: What are the natural talents you use and consistently bring satisfaction to you when you are doing what you enjoy most and doing it well? What is the subject matter that you gravitate to without even trying? What circumstances or conditions have to exist in the job environment to bring out the best in you? How do you naturally build relationships with others? There are many elements of your pattern that need to be identified and defined in order to create an Ideal Job Description and correlate it to specific opportunities in the world of work. I will create a complete picture of your motivational pattern. This picture of you is then harnessed to an Action Plan that uses your natural strengths and motivations to leverage you into real jobs. Here’s some startling statistics. Neither diet nutrition nor exercises; neither intelligence nor genes will be the number one determinant of how long you will live. According to a recent study conducted by the British Medical Association, the greatest deciding factor in how long you will live is job satisfaction! And that’s not all. If you average only $30,000 per year, you will have earned $1.2 million in 40 years. In other words, we are all millionaires in our lifetimes. But eminent organizations such as the American Management Association and the Menninger Clinic estimate that as much as 90% of North America’s working population is not in their right work with tremendous consequences to their personal health and quality of life. Did you know that some 58% of employees who work 30 years or more in a job they hate never collect their first pension check? Do you want to gamble with odds like that? Furthermore, how many collect a pension for one year or less then die, or two years, or five years? What’s your limit for the trade-off between career pain and pension? Live long and prosper through job joy! Wake up every morning with more passion and purpose in your life! No more Monday morning blues! No more "working for the weekend" or countless hours of wishing you’d stayed in bed! No more boring days coasting to uneasy retirement and wasting precious years of your life that are leading to an uncertain future! The future of your career life is at stake! To what degree do YOU care about the lack of spontaneity or creativity in YOUR work, and to what degree are you willing to change anything in this area, assuming it is possible to do so? Imagine. For the cost of two or three car payments, you can add value to your quality of life (unlike a car, which costs even more money as soon as you drive it off the lot). This information gives you the power to create money for yourself. "Our sessions enabled me to start on a path of inner enlightenment. I was able to realize the importance of my personal story. I recognized the power is within myself to experience Job Joy. Thanks for launching me on a fascinating journey." 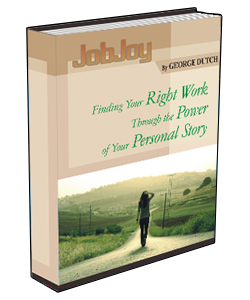 In essence, the JOBJOY REPORT is a powerful tool for successful career transition.